Snap beat on both the top and bottom lines, but said its daily active users fell by 2 million. Shares are set to open at a record low on Friday, down more than 12%. Watch Snap trade live here. Snap is set to open at a record low Friday morning after its third-quarter results showed a drop in daily active users. At first glance, it looked like a solid quarter for the social-media company as it reported an adjusted loss of $US0.12 a share on revenue of $US297.7 million, beating the $US0.14 loss and $US283.36 million that were expected. But alongside those results, Snap said its daily active users totaled 188 million, down 2 million, or 1%, from the previous quarter and that it expects the number to decline further in Q4. Shares spiked to a record-high $US21.22 in February after the company reported strong fourth-quarter revenue and a big jump in users, but that is where shares topped out after the rollout of the unpopular redesign. Since Jenner’s tweet, more than $US13 billion in market cap has been wiped out as the company has struggled to retain users. 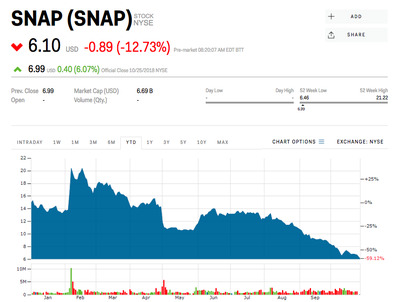 But things might not be as bad as they appear for Snap, at least according to one Wall Street analyst. “Snap reported good 3Q18 results with revenues above forecasts driven by better-than-we-thought international trends (and worse domestic ones) along with guidance and broader trends that were consistent with our prior expectations,” Pivotal Research’s Brian Wieser said in a note sent out to clients after the results. “Our price target remains at $US8 per share on a YE2018 basis, which continues to lead us to rate the stock BUY.